The govt has accepted the recommendations of the committee on defence pension anomalies headed by the Cabinet Secretary. The govt sanction letters dealing with the subject would be published and notified in the (very) near future. (a) Pensions of pre-2006 PBOR to be computed by taking into account the top end of 5th CPC scales and notionally (through fitment formula) configuring it within the 6th CPC pay bands instead of basing the same on the minimum of the new scales. Practically speaking, a pre-06 Sepoy who was placed at about Rs 3700 basic pension after the 6th CPC would now be granted a basic pension of appx Rs 5500, a jump of almost Rs 1800. There may now emerge some cases wherein the pension of pre-06 retirees may turn out to be more than those of post-06 retirees at certain levels. It may be recalled that prior to the 6th CPC, pensions of PBOR were calculated by taking into account the end of scale whereas for civilian employees and officers the start of scale was taken into consideration. However the 6th CPC had blurred this edge because of the introduction of running pay bands and abolition of separate pay scales for each rank. (b) Pensions of pre-06 Lieutenant Generals to be upgraded to Rs 36,500 per month. The figure of Rs 36,500 is arrived at by taking into account 50% of the minimum of new HAG scale (Rs 67000-79000) and adding an MSP fitment of Rs 3000 (50% of MSP @6000). (c) No further improvement or OROP for commissioned officers. (d) Ceiling on war injury pension (that the total of service element and war injury element of war injury pension should not exceed the last drawn pay) has been removed. (e) Anomalies in other casualty pensionary awards to be deliberated upon by the Department of Ex-Servicemen Welfare (ESW) at MoD. It’s that time of the year again – time to pay income tax. But as mentioned earlier on this blog, gallantry awardees and disabled retirees are exempted from Income Tax on the entire pension. It would be worthwhile for such retirees to go through this earlier post for complete understanding of the requisite law and for downloading the requisite notifications if required. Secondly, there was a controversy whether the NPA is to be added as an element in the minimum of the new pay bands for computing the new pension of pre-06 AMC retirees. The govt has clarified that NPA is not to be added into the pay band for computing pension of pre-06 AMC retirees as well as civil doctors. The directions of the govt are based on the 2006 decision of the Hon’ble Supreme Court in Col B J Akkara (Retd) Vs UOI. The clarification of the govt can be accessed by clicking here. There is an increasing tendency amongst us to disregard and disrespect our past and present comrades, and I do not have to amplify this further since most of us would understand what I am pointing at. Let us make it a point to help out our officers, soldiers and their families, past and present in whatever little way we can, let us not treat petty inconsequential requests as liabilities. Before pointing fingers at outside agencies, let us first look within. We should go all out to provide all assistance that we can and get out of this I, me, myself mode. Which brings me to one point. We all are aware that the govt has been trying hard to attract and retain talent in the services. One such move has been to promote the concept of Short Service Commission and arm released SSCOs with a good corporate career after their stint with the services. As has been discussed earlier on this blog, the central govt through a Presidential sanction had removed the pre-condition of being a ‘pensioner’ to avail limited medical facilities in military medical establishments and had ordained that all personnel granted the status of ex-servicemen would be entitled to such medical facilities. Still, in blatant contravention of govt orders and missives by the Army HQ, non-pensioner ex-servicemen were denied their rightful dues ostensibly now since the matter had attained the proportions of a ‘prestige issue’ for a limited few. Even today these limited few are treating the matter of medical care to our old veterans very lightly. In a welcome move, the Punjab Sainik Welfare Directorate has now written to all concerned highlighting how this attitude is leading to failure of GoI medical schemes which were specially designed for non-pensioners. For a non-pensioner (non-ECHS member) ex-serviceperson to avail medical re-imbursement from the central govt under GoI schemes, a certificate is to be issued by an MH that the facility is not available in that particular hospital, hence when in the first instance there is reluctance in even accepting non-pensioner ex-servicemen at MHs, the second step of issuance of such a certificate never materialises. And who are these non-pensioners ex-servicemen readers may ask. Well, the definition has been altered from time to time but this category includes our ECOs who are in their late 60s to late 70s and World War II veterans in their 80s to 100s who were released due to reduction in establishment, besides SSCOs who are not re-employed. To disown them at this stage by blatantly ignoring GoI and Army Orders for medical facilities is not only illegal but also unethical. While the office of the DGAFMS makes out a claim for DACP with the Army HQ and the Govt of India, it should first clean up its own house and ensure that already existing govt sanction letters are not consigned to files and bins in M-Block. Point No 1 is a resultant of an order of the Hon’ble Punjab & Haryana High Court which has been upheld by the Hon’ble Supreme Court so there was no escaping this by the Govt. Point No 2 is a resultant of the recommendations of the 6th CPC and the same has also been accepted for civilians, so what extra has been initiated for faujis in this ? Point No 3 is also a resultant of a Finance Ministry missive by way of which the Higher Administrative Grade (HAG) on the civil side has been upgraded to Rs 67000-79000, something that has been applied to our Lt Generals too in a parallel fashion, so again what's special for faujis ? I would again reiterate, that this play of words is the work of some lower level spin doctors who do not let our Ministers, Parliamentarians, top bureaucrats and top brass understand the minute modalities of such matters. They have led the top echelons to believe that much special has been done for defence pensioners but the truth is quite removed from reality. It is not an obligation that Hon’ble SC orders have been implemented and again not quite an ehsaan that the changes such as removal of 33 years’ service requirement for full pension or grant of HAG, changes which as it is have been initiated in the universal pension and pay regime, have been duly extended to the defence services. I say it again, it’s time for the higher civilian and military establishment to wake up before the army of promoted lower bureaucracy takes the system and the nation for a ride. Information which should ideally reach top political, civil and military echelons is filtered by the heavy tentacles and thick mesh of lower bureaucracy, a malaise which is eating into whatever progress we are making. There is only one answer to this : proper application of mind on file notings and minute sheets initiated from below. Let us stop affixing ghuggis and start imposing our grey matter on the notings of the supervised staff. The orders for implementing Hon'ble Supreme Court's judgement in UOI Vs SPS Vains case can be accessed by clicking here. These instructions were issued by the PCDA(P) yesterday in pursuance of the Govt sanction released on 15 July 2009.
" All retired Major Generals and equivalent in Navy and Air Force who were in receipt of pension as on 1st October 2001 are required to apply to their respective Pension Disbursing Agency for revision of his/her pension in terms of these orders in the prescribed form as per Annexure-I attached with Govt. letter dated 15.07.2009 immediately but latest within one month from the date of issue of the Government letter i.e. by 14.08.2009 positively. Affected pensioners not applying within stipulated time will not be entitled to interest @ 10% per annum for the period by which submission of application beyond the stipulated period is delayed. " Well, someone should advise the PCDA(P) not to indulge in self-interpretation of court directions even while the Respondents have not yet been discharged from the contempt proceedings. It is the orders of the Hon'ble Supreme Court followed by the Presidential sanction letters which have to prevail, and such imposition of a self-initiated suo-moto stipulation is void ab initio. Firstly, How would all affected parties get to know of these GoI / PCDA(P) instructions and the one month condition ? Are they going to inform each and every person or issue a press release ?. Secondly, such riders can never be initiated from the date of issuance of letters, if at all such a rider was conceptualised, it could have only been done from the date of communication to the affected parties. Thirdly, the Hon'ble SC had not imposed any such stipulation and this clearly amounts to interfering in the administration of justice. Fourthly, on 04 May 2009 while hearing the contempt petition, the Hon'ble SC had directed the release of arrears within a period of 3 months, that is, by 03 August 2009, while the authorities concerned have completely vacillated on the issue since the time of the dismissal of the Review Petition filed by UOI in February 2009, they expect our old veterans to complete the formalities now at the speed of the sound. Very unfortunate indeed. The Higher Administrative Grade (HAG) of Lieutenant Generals has been revised. From the earlier Pay Band-4 + Grade Pay Rs 12,000, all Lt Gens have now been placed in a new scale of Rs 67000 – (3% increment) - 79000 with a jump of Rs 6000 within the scale on promotion to the rank. The corrigendum SAI has already been signed and issued. Of course, the senior-most 33% of Lt Generals still remain in HAG+ which is an even higher grade (Rs 75500-80000). Lt Generals placed as Army Commanders (and equivalent) / Vice-Chiefs are already in the apex scale of Rs 80000 (fixed). As a result of this, the pension of pre-2006 retired Lt Generals would be placed @ Rs 36500 basic per month (50% of min of scale + Rs 3000 as notional MSP fitment). Pension of post-2006 retirees shall continue to remain a little higher at 50% of last drawn emoluments. The decision has been implemented wef 1-1-06. Don’t be surprised if in the coming days the same scale is also granted to all other HAG officers of the Central Govt. It may be recalled that most of the pre-2006 retired All India Service Officers (who were direct appointees) were from the HAG and if the same scale is implemented for them, they shall be placed at a basic pension of Rs 33500. After the 5th CPC, the govt had set up a committee to look into the anomalies in the pay-scales of PBOR and to rationalise the grouping scheme. Ultimately, the classification was re-grouped from A-E to X-Z. The anomalies were removed and pay scales bettered. So far so good. However, the govt while notifying the new scales, made them applicable w.e.f 10-10-1997. Moreover, the pensionary benefits of the enhanced scales were granted only to PBOR who retired on or after 10-10-97 and those who were discharged between 1-1-96 and 9-10-97 were granted lower pension scales. A comparison can be made between this table (retirees between 1-1-96 and 9-10-97) and this one (post 10-10-97 retirees). The Hon’ble Punjab & Haryana High Court however had held in late 2008 that since the committee for improvement and rationalising of scales was constituted to remove the anomalies of the 5th CPC, the benefits would have to accrue from 1-1-96 for all and hence the date of 10-10-97 was an artificial date with no reasonable nexus with the objective sought to be achieved which was elimination of 5th CPC incongruities. In short, the Hon’ble Court held that the removal of anomalies would have to be back-dated to the date when such anomalies had arisen. The govt had challenged the said verdict of the Punjab & Haryana High Court in the Hon’ble Supreme Court through a Special Leave Petition but the same has been dismissed and this important decision by the Hon’ble Punjab & Haryana High Court has hence already been upheld. Secondly, many non-pensioner ex-servicemen such as ECOs and SSCOs have left comments on the blog seeking guidance on how to become members of ECHS. I’ve said this earlier and I’ll say it again - Non-pensioners are NOT entitled to ECHS facilities. Non-pensioner ex-servicemen are only authorised medical facilities in MHs in accordance with a Presidential sanction on the subject but they cannot become members of the ECHS which is a scheme restricted to pension-holders. Just as pensioners are authorised ECHS, non-pensioners are authorised to avail of a medical re-imbursement scheme run by the Kendriya Sainik Board (KSB) wherein expenditure of major surgeries to the extent of 90 % for PBOR and 75% for Officers (which earlier was 75% and 60% respectively) can be borne by the KSB. You may peruse this earlier post for more details on the same. Thirdly, readers interested in the subject of transparency in administration and / or RTI may want to visit the website of RTI Users’ association http://www.rightto.info/ Let us encourage the association by registering ourselves as members. Basic FAQs on RTI are also available in a fundamental format on the site for people new to the subject. Go to 'click to login' tab on the left side of the ibid site to register as a new user. Fourthly, Major Surender Singh would like visitors of this blog to visit his newly initiated blog http://www.theindiananalysis.blogspot.com/ You may want to give it a dekko. The pictures above may astonish some as to their relevance here. But these have some application to the subject I want to discuss. 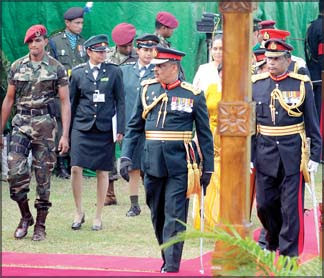 On a recent private visit to Sri Lanka, I was cheerfully surprised to see women soldiers in civilian areas of Colombo going about their day to day activities with total professionalism, the cheer was about their utmost dedication, and the surprise was about the fact that the soldiers were not officers but Other Ranks. One. Hurling allegations of sexual advances against male colleagues is something that can happen in any occupation, not just the armed forces. Ethics are on the decline north south east and west, being a man or woman has nothing to do with it. Two. One woman officer getting the sack generates so much heat, while we conveniently overlook the many men who have similarly been shown the door - it is not about gender, it is about character. High time to end this kind of positioning vis-à-vis women in a progressive society, let us allow the armed forces lead by example in allowing women utilise their full potential while in uniform. Impropriety knows no gender. 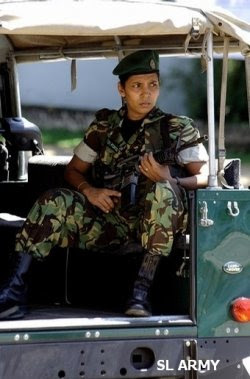 Soldiering in women is not even an issue in countries like Sri Lanka while it is made out to be such a big deal by us. While deployment of women at the battlefront may rightly remain a debatable subject, in other arenas, women are here to stay and the sooner we accept and make them (and the men) comfortable, the better. Let us grow up, a look on my calendar shows it’s 2009. Well, the threat of strong action under the Indian Penal Code by the Central Information Commission (CIC) against two officers of the DoPT has had the desired effect. DoPT has officially issued a circular to all Ministries and Departments that file notings have to be disclosed under the RTI Act. The action came against the backdrop of serious vacillation on the part of the DoPT to correct contents of its website wherein it was stated that ‘file notings’ were not a part of the definition of ‘information’ under the RTI Act. Despite various decisions by the Central Information Commission declaring file notings disclosable under the Act, the DoPT did not amend the web material. In fact, even in the face of specific directions to remove the offending portion from its portal, the department failed to act in the matter fully knowing that as per the RTI Act, CIC decisions are binding on public authorities. Some officers suggest that disclosure of file notings and minute sheets would lay open to scrutiny their decisions in tough public matters, not realising that transparency is much more important in public life than secrecy of identity. Moreover, officers taking decision as per law with proper application of mind have nothing to be afraid of. File notings have an important role to play in public administration – it is these notings which bring to light the logic or reasons behind administrative decisions and matters of public policy, it is these notings which disclose whether a particular public authority acted in a bonafide manner or was misled into taking a particular action by someone in the channel leading to the particular final policy decision. File notings also assist Hon’ble Courts of Law under the writ jurisdiction since the rationale and motives behind objectives sought to be achieved through public policies and decisions are disclosed and laid bare, which is good for any democracy, especially where public servants (masters ?) tend to hide behind a thick veil of official secrecy. At last some simplification of procedure, albeit after constant requests by the services and 62 years down our independence. The Controller General of Defence Accounts (CGDA) has passed instructions to the concerned CDAs to release pay and all financial benefits to officers on the basis of Part II Orders / GENFORMS / PORs issued by military establishments and supported by the relevant branch of the Services Headquarters without waiting for publication of Gazette Notifications related to substantive promotion. Though the system of processing draft govt notifications (DGNs) would continue as before, the pay and allowances shall not be contingent on the same. The orders signifying the substantive promotion (on the basis of which the pay and other financial benefits shall be released), would have to contain information such as the fact that the officer has completed the requisite qualifying service, he / she is not under DV Ban, he / she has passed eligibility examinations etc. A welcome step since processing of DGNs was causing undue delay in processing of pay and financial benefits of officers. At times such delay was not in months but in years. The govt has finally notified an extremely well deserved relief to Havildars granted the Honorary rank of Naib Subedar. Till date, Hony Naib Subedars were granted a pension of Havildar with Rs 100 as an additional benefit for the Honorary rank as per Regulation 137 of the Pension Regulations for the Army – 1961 (as amended in 1991). A mere pittance it was !!! Accepting the recommendations of the 6th CPC in this regard, the govt has notified that Havildars granted the Hony rank of Naib Subedar shall now be paid a pension of a regularly promoted Naib Subedar. The said benefit would however only be extended to pension and not for encashment of leave etc. In actual terms, what does it translate into ? The orders can be viewed and downloaded by clicking here. 'The Tribune' has also covered the issue today. A large number of short-service commissioned (SSC) officers, who were deprived of medical cover at the military hospitals, would now be entitled to avail the facilities once again. Earlier, SSC and Emergency Commissioned (EC) officers were entitled to treatment at military hospitals. However, directives issued a few months ago by the Directorate General Armed Forces Medical Services (DGAFMS) apparently in contradiction of presidential sanction and Army orders, had debarred them from seeking treatment at the military hospitals. Sources said a communiqué issued by Army headquarters last week clarifies that medical facilities to SSC and EC officers had not been withdrawn. “A circular issued by Headquarters Western Command states that SSC and EC officers are not to be denied medical treatment in the military hospitals till further orders,” Brig IS Gakhal, director, Sainik Welfare Punjab, who hade taken up the issue with the Defence Ministry, said. The orders affect thousands of short service officers and their families. Denial of medical facilities had also rendered ineffectual a central scheme for SSC officers under which 80 per cent of the cost of major surgery was borne by the Kendriya Sainik Board, since it required verification by military hospitals. The scheme was introduced because SSC officers are not covered under the Ex-servicemen’s Contributory Health Scheme on the account of being non-pensioners. Last year, DGAFMS wrote to all Army commands that they were not entitled to medical facilities as these were available only to service pensioners. Since the early 70s, the Army has been inducting about 500 SSC officers annually. In the wake of the 1962 Indo-Pak war, thousands of ECO were also commissioned. Earlier, medical facilities were only available to ex-service pensioners and their dependants and families of deceased personnel drawing pension of some kind. Then in 1996, the MoD directed that the term “ex-service pensioners” be replaced by the term “ex-servicemen”. Consequently, entitled categories became ex-servicemen covered under the definition of “ex-serviceman” issued by the Department of Personnel and Training, their dependants and families of deceased personnel drawing pension. Officers said DGAFMS seemed to have failed to correctly interpret that the sanction for medical facilities was issued by the President through the Defence Ministry and not by the Department of Personnel and Training. Inboxes of veterans have been flooded by mails announcing the acceptance of the principles of One Rank One Pension (OROP) and Parity in Pensions (PIP). Even certain tables purported to have been accepted by the Govt have been attached with such mails. The triggering factor has been the ambiguous reports on the issue by certain sections of the media. It would not be proper to rejoice over such tables. Neither would it be proper to take hopes to such levels which result in serious frustration and embarrassment at a later stage. The govt has not yet accepted or recommended any such tables. The people assigned to the task are still looking into the issue and have not yet decided the matter at hand. In all probability, the new pension regime would be based on a formula or a rank-wise one time increment (OTI) to bridge the gap between past and present pensioners. It is also unlikely that officers’ pensions are made amenable to the new system. My only request to veterans is to refrain from circulating mails which may raise false hopes and cause (avoidable) discomfiture at a later stage. The committees and our service headquarters are working hard to bring about an acceptable solution and we should stand by them and hope for the best.